Police Evict Dakota Pipeline Protesters : The Two-Way Police officers, some of them in riot gear, removed protesters who refused to leave private land in North Dakota where a pipeline is supposed to be built. Dakota Access Pipeline protesters defy law enforcement officers asking them to leave private land in the path of pipeline construction. Police have removed protesters from land owned by pipeline company Energy Transfer Partners in North Dakota. At least 117 people were arrested, according to The Associated Press. News reports say officers used pepper spray against protesters, but no serious injuries were reported. Beginning at 11:15 am MT, officers moved toward a group of people camping out near Highway 1806 near the town of Cannon Ball, N.D. According to The Associated Press, some of the officers were in riot gear, some were armed and they arrived with soldiers driving trucks and military Humvees. They also deployed helicopters and an airplane that monitored them from above. The Federal Aviation Administration began restricting flights over the area on Tuesday afternoon and will continue to do so until Nov. 5, according to the FAA website, which cites "hazards" in the area. The police operation came the day after the Morton County Sheriff's Department asked protesters to leave the land, which is in the path of the Dakota Access Pipeline under construction. An image posted on Facebook by the sheriff's office showed a line of law enforcement officers with Humvees and a group of people with tents on a bridge. In a video streamed by one of the protesters, Dallas Goldtooth, a loud siren wailed in the background as people milled around on a blocked road. "Move to the south," a man on a loudspeaker said from the direction of the police line, to which someone in the group of protesters responded with a shouted expletive. "Everybody move south. We will not hurt you," the voice on the loudspeaker continued, apparently directing protesters back to a federally owned area where they have been camping for months. "You need to walk to the south camp." Members of the Standing Rock Sioux tribe and their supporters have been protesting the pipeline since it was approved by the U.S. Army Corps of Engineers over the summer. They are specifically trying to block the portion that is slated to run under the Missouri River near the Standing Rock Sioux Reservation. The tribe opposes the pipeline because it says the route crosses sacred sites and burial places, and it is concerned that if the pipeline ruptures, an oil spill could pollute drinking water, as The Two-Way has reported. Earlier this month, the Standing Rock Sioux lost a bid in federal court to halt construction, paving the way for work on the $3.8 billion pipeline to continue, as we've reported. Almost immediately afterward, three U.S. agencies "announced a halt to work in one area significant to the tribe." The chairman of the tribe, Dave Archambault II, called on the Department of Justice to investigate what he called the "overall militarization of law enforcement response" in a letter to Attorney General Loretta Lynch. "Peaceful protests are being met with military vehicles and heavily armed law enforcement personnel in riot gear. Rather than seeking to keep the peace, law enforcement personnel are clearly working in tandem with private security of Dakota Access. 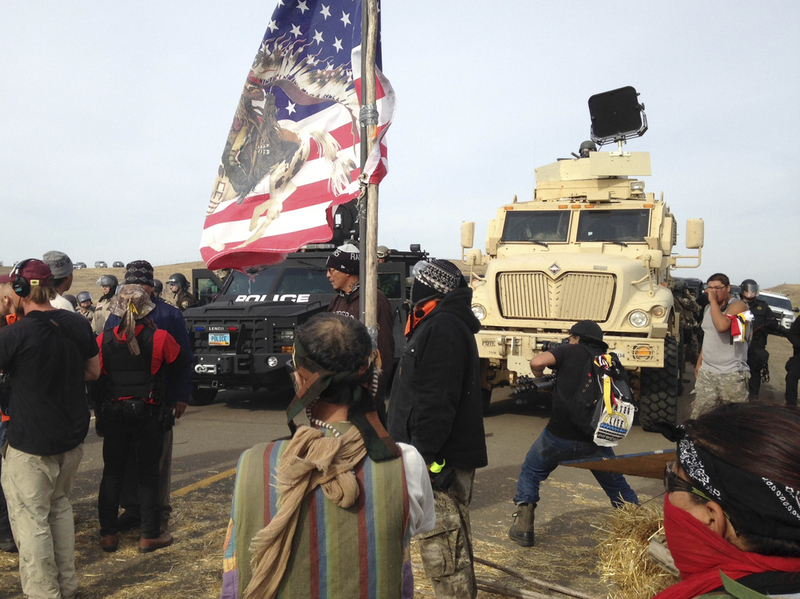 "To many people, the military tactics being used in North Dakota are reminiscent of the tactics used against protesters during the civil rights movement some 50 years ago. And I believe that there are similarities there. "But to us, there is an additional collective memory that comes to mind. This country has a long and sad history of using military force against indigenous people – including the Sioux Nation. I would like to think that those days are past – and that today Tribal rights cannot be ignored and military force cannot be used to suppress Indian people. But when I see the militarization taking place in North Dakota against Indian people, I am genuinely concerned." "We have no power," Archambault said in an interview with NPR. "I can't tell you how much I appreciate people willing to stand beside us." "For months protesters have described us as an aggressive police force," Sheriff Kyle Kirchmeier said in a news release on Wednesday. "We have done nothing but demonstrate patience and restraint. The last thing we want is a confrontation." The Morton County sheriff also announced Thursday that the county had filed charges of felonious restraint against James White and Kareen Lewis after an alleged confrontation between protesters and journalists on Oct. 18. A previous version of this story said the Standing Rock Sioux tribe lost its appeal to halt construction on the Dakota Access Pipeline. The tribe had sought an injunction, which was denied, as part of a larger case.